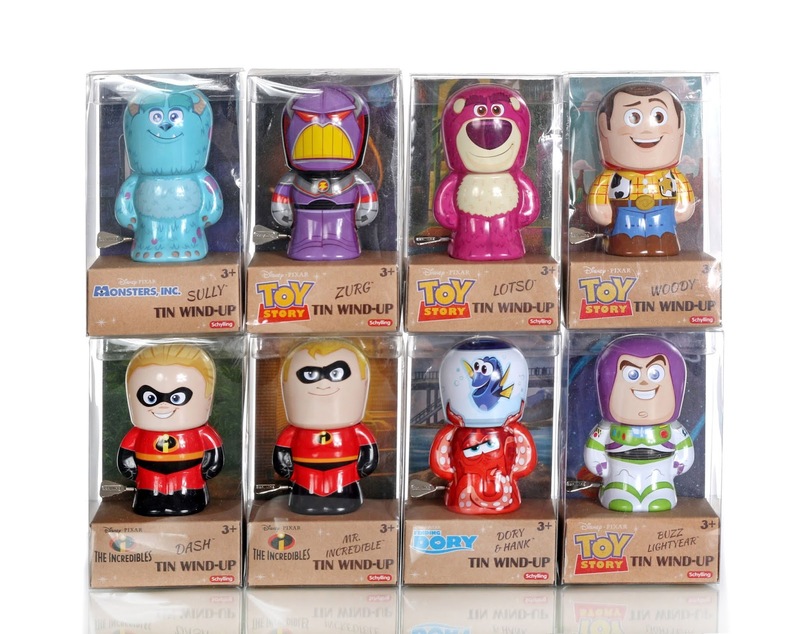 If you've followed along here for some time, you might know that I'm very fond of both traditional tin toys AND classic wind-up toys...so naturally, you have an instant "must have" for me as soon as you combine those elements and add Pixar to the mix. 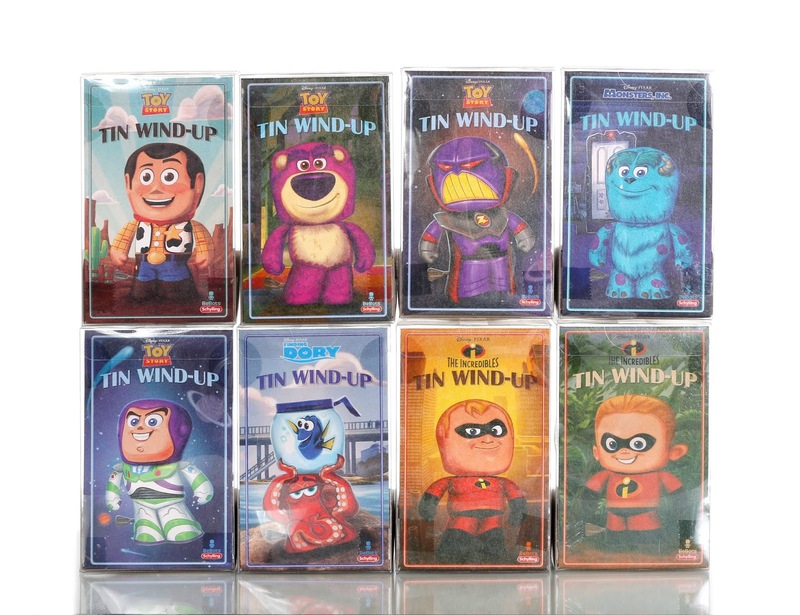 Check out this amazing collection of Pixar Tin Win-Ups created by Schylling Toys! I actually got this full assortment last Christmas (wow–almost an entire year ago), so I don't know why it's taken me this long to do this post. Time just moves too fast! Regardless, I've been so excited to share these with you and happy that I'm finally getting around to posting my review of them. I've mentioned this before here, but ever since I was little, my parents would get me an old fashioned tin toy or two every Christmas. It became a tradition that still lives on today! Last year I picked out these to fulfill that tradition. This marked the first time I ever got any tin toys that also combined my love for Pixar. It was the perfect choice! As of right now, there are eight detailed Pixar characters in this collection (all measuring 4" tall): Sulley (yes, they spelled his name wrong on the package), Zurg, Lotso, Woody, Buzz Lightyear, Hank/Dory, Mr. Incredible and Dash. These are all part of Schylling's "BeBots" series of high quality wind-ups (which also includes Star Wars characters and more). The best part of these is their overall designs. The artist (whoever that is, wish I could give props here) did an outstanding job on each and every one of these. They're all stylized in such a visually appealing way. Striking, vibrant and adorable. So unique! I love 'em. Usually for my reviews, I would unbox the items and take detailed loose pictures as well. In this case though, I love the packaging (and how they're displayed in the boxes) so much, that I wanted to keep them mint for now. I'm usually one to display my items loose, but these are just too good as they are. They look fantastic atop my Pixar bookshelf! The character art on the back of the boxes (as well as the backdrop art within the boxes) is just too cool. Huge fan. We picked these up on ShopDisney last year (not there anymore), but they're also all available on Amazon for around $12. If you're interested in adding these to your collection, you can order any or all of them below by using the affiliate links provided. 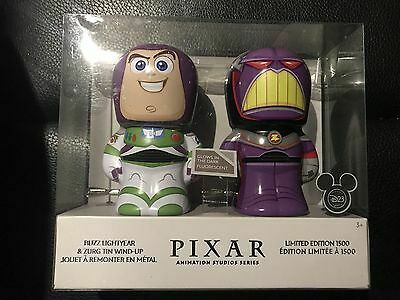 I also wanted to note that there is a Limited Edition D23 Expo 2017 Exclusive 2-Pack (featuring this same Buzz and Woody) out there as well (seen HERE). Did you purchase these (or plan to)? Which one is your favorite? I think they're all great, but I do have to say that the Hank/Dory one is probably the most cleverly designed. Let me know your thoughts down in the comments!